Manx Youth Opportunities. Manx Flag Flies in Peru. Nigel Watson. Isle of Man flag flies in Machu Picchu. Manx Youth Opportunities aims to help young people in the Isle of Man to gain work experience and to develop their career path. In November 2012, one of the young people associated with the group – James Wren – headed off for Peru to walk the Inca Trail and discover the wonders of Machu Picchu. Starting off at the Isle of Man airport, James’ journey took him via Heathrow and Madrid airports before landing at Lima, the modern day capital of Peru. From there he took an internal flight to Cusco, a popular venue for starting the Inca Trail. The Classic Inca Trail to Machu Picchu is the most reknowned trek in Peru. It is a challenging journey that culminates in reaching the Sun Gate to see the sunrise over the ruins of the famous Inca city. Raising money for The Childrens’ Centre. 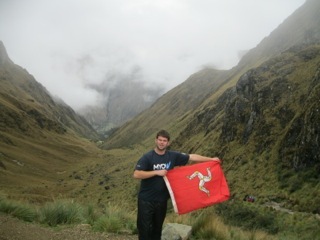 When James arrived at Machu Picchu he waved the Isle of Man flag and became the Manx Youth Opportunities’ Ambassador to the ancient kingdom of the Incas. James’ journey also raised £3500 for the Childrens’ Centre in the Isle of Man. If you would like to read James’ journal for his trip, the full text is at the link below.